Buzzers need no introduction to the seasoned fly angler, yet the newcomer initially finds the fascinating world of insects bewildering to say the least. Hopefully, armed with a little understanding the beginner should be able to approach the water with confidence. Collectively referred to as “buzzers” by fishermen, the chironomid or non-biting midge consists of over 400 species and buzzers are the most important insect group to stillwater trout and fly fishermen. It’s easy to see why, as hatches of one chironomid species or another are capable of occurring on any given day of the year. In fact, years ago, while doing a little winter repair work on an upland fishery, I recorded both hatching and adult midge in December. Amazing, considering only a small section on the tarn was ice-free. Anglers don’t have to identify individual species. What matters most is buzzer size, colour and behaviour. THE egg stage is really of little relevance to us. Once they hatch at the surface, tiny larvae descend to the safety of aquatic vegetation and silt. Depending on species and development this worm-like larvae stage may vary in length from fractions of an inch to maybe an inch or more. Although the best known colour of the natural is red, hence the name bloodworm, they also occur in other colours with pale olive, brown, yellow and almost transparent the most common. Some species prefer to develop among weed and although weak swimmers, I guess they can be classed as “free-swimming”. Others seek a nice silty bottom to shelter in tube-like burrows. Consequently I often wonder about the availability of bloodworms to trout? Fish foraging around will undoubtedly chance upon many larvae in weedy areas but I’m certain the larvae tucked up in burrows are far safer - or are they? It’s questionable if they get disturbed by rough weather conditions especially at any appreciable depth. However, I’ve come across trout with stomachs full of muddy sediment and there, on closer inspection, have been copious amounts of bloodworms. 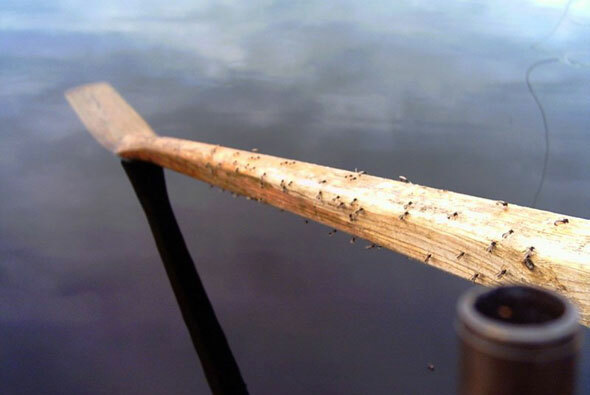 This occurrence has been witnessed many times, suggesting that trout will grub around for midge larvae. Although larvae are a valuable food source for trout the year round, for me, winter and early spring remain key times to use suitable imitations. 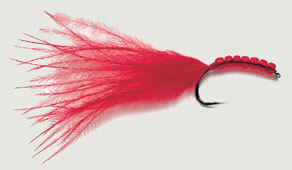 Because the natural moves at such a slow pace a floating line and long leader are a great way to present your flies. The actual leader length needs to be tailored to each situation. In shallow water a shorter setup can be used. Deep water may need a 20ft leader when prevailing conditions permit; unfolding such a leader in to the teeth of a gale isn’t easy. While a single fly on a long leader works, hedge your bets by using two nymphs. Positioning a dropper 3-5ft up from the point not only helps with turnover, it gets both flies fishing deep, quickly. Where possible, look for a crosswind, which affords the nymphs a more natural drift. Cast out and let the whole lot sink. Any wave action will now “bow” the line and, rather than retrieve, just take up the slack, keeping in touch with the flies. Like all nymphing, takes may vary from the slightest of twitches to the line sliding away in textbook fashion. Remain vigilant and react quickly to any movement of the line. Sight indicators are ultra sensitive for this kind of fishing and can put you in touch with takes that may have otherwise gone unnoticed. Sweeping the rod sideways, in an upwind direction, rather than striking vertically helps make a faster contact with the fish. The upward lift usually involves taking up slack line before connecting, allowing trout enough time to “spit” the fly (see diagram below). There is also scope here to fish a Hi-D line with buoyant type nymphs (Booby style). If you adopt this approach, keep in constant contact with the flies and respond to any takes instantly. MOST fishermen will relate best to this stage. Having undergone the transformation from larva to pupa, the pupa undertake a perilous journey from the lakebed to the surface. At the mercy of drift currents these thrashing pupae are easy pickings for fish. The pupae are intercepted by trout at all levels within the water column but they are arguably most vulnerable at the surface when trying to emerge. The size and colour of imitations often depends on species present and geographic location. Generally speaking, “up North” our chironomids tend to be smaller than those of say Rutland, where I hear that sometimes a size 8 dressing is needed to resemble the naturals. In my neck of the woods, I’ve recorded dark brown buzzers of 19mm in length and we are lucky enough to experience the “grey boy” hatches that are best copied on a size 12 hook. However, a glance in my fly box indicates that size 12-16 is the dominant sizes. Hatch periods may also change with the seasons. During spring expect the bulk of any activity to heighten from late morning and into the afternoon. In my experience the warmer weather of summer sees buzzers coming off throughout the evening, late into the night and again at dawn. I well remember a particularly hot spell a few years ago when the evening rise kicked off at 10pm and continued into the small hours when you could hear that magical “buzz” of adults all around. Dawn activity has the added bonus of being undisturbed when the fishing can be as good as it gets. Autumn follows a similar pattern to spring when daytime hatches are best. As winter takes hold, don’t despair. Look for emerging buzzers from 1-3pm. although hatches are never quite as intense or long lasting. Many patterns have been developed to represent the buzzer pupa and mine tend to be based on Gordon Fraser’s flies. His book “Mastering the Nymph” and past articles in Trout Fishermen greatly influenced my approach to imitative fishing. Whichever pattern you choose the emphasis should always be on presentation. Although we are often aware of what’s happening on the surface, in deep water, fish may well be harvesting buzzer pupae. Fishing a couple of representation at depth will put you in touch with fish long before any buzzers are due to appear. These ought to be slim, compact dressings of the Superglue and epoxy type. Coupled with long fluorocarbon leaders with the flies positioned closer together, it’s surprising how deep such nymphs will go (see diagram). To assist turnover a tapered section should be attached to the fly line. The Airflo 5ft poly leaders are ideal for such circumstances and different densities allow a lot more versatility when it comes to plumbing the depths. To this I build a leader of some 6- 8lb depending on location and size of fish expected. Apart from being a good all-round pattern the Diawl Bach can be deadly when trout single out buzzer pupae and I’ve known times when this has outfished a more exact copy. Generally the Shuttlecock and Suspender Buzzer share the same water space and I fish both when buzzer pupae are in the surface film. But landing light, the Shuttlecock can often give you the edge. In a variety of colours, this pattern is arguably the number one fish taker on stillwater. 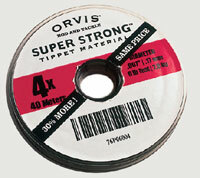 Cover with epoxy to fish deep (see page 56) or dress light to fish the surface. For midwater nymphing the flies may be positioned further apart and we can look to using lighter dropper patterns with maybe a slightly heavier point fly. In a bid to give the nymphs as much freedom as possible, I choose copolymer leader, which is quite limp for its diameter (left). To exploit the top 2ft of water lightweight pupa patterns are a must. These should be tied with dubbed or herl bodies and as ever, slender is the byword when dressing all buzzer imitations. I base a lot of my flies around Gordon Fraser’s early BP Buzzer for fishing this upper water column. Remember too that some of the naturals take on a brilliant silvery appearance now. This I understand is down to them generating oxygen within the shuck and I’ve seen many pupae exhibit this trait in the stomach contents of trout. THIS is the natural’s critical stage as it’s extremely vulnerable. Waves make it easier for buzzers to break through the surface film, but in a flat calm surface tension can delay or even prevent pupae from hatching. Tired and weak these insects are easy pickings for trout. So, it’s important to keep the nymphs near the surface for longer. Try two pupa patterns on droppers with a Suspender Buzzer on the point to hold the flies up. Bulging rises often mean trout taking nymphs just sub-surface. Then, I’d use three lightweight imitations 5ft apart. Be mindful that the flies may drop through the feeding area quite quickly. If you get no takes, try two flies, before attaching a Suspender Buzzer on the point. Sometimes, you may have to use a single buzzer. Trout may be so focussed on pupae just subsurface that Suspender Buzzers and even Shuttlecocks have failed to tempt them. Changing to a single pupa with a greased leader that literally holds the nymph in position is the answer. Present static as any attempt to move the leader creates a nasty ‘V’ wake emanating from any knots. It’s time to think of dry fly. Along with the Shipman’s, Shuttlecock and Canning’s Haystack, I include the Suspender Buzzer. In smaller sizes, use Hoppers and Bob’s Bits, as they’re deadly when trout move at the surface. If there’s enough ripple, use a two-fly cast, as constantly targeting risers means changing direction when casting and three flies are more prone to tangles. Calm conditions mean a single dry on a tapered copolymer leader. Successfully hatched pupa soon mate and the females return over water to lay eggs. During dawn and dusk, when a light breeze ensues, the egg-laying females litter the surface and trout take advantage. I use a small spent midge pattern or small Bob’s Bits or Shipman’s Buzzer. With no hatch in progress use suggestive flies like Diawl Bachs, Hare’s Ear and Crunchers. Their general nymphy profile appeals to buzzer feeding fish while also covering a wide range of insect types. So whatever the fish are feeding on, success is likely. Once the trout’s diet has been established by spooning, it pays to copy the size and colour of certain buzzers. Apart from the winged adult, all stages of the chironomids are slow moving. So, one famous suggestion is “sometimes the best retrieve is no retrieve at all” and this is true when copying the behaviour of buzzers. Ideally, look for water movement like cross and headwinds, these drifts can be used to present the flies naturally. Having cast out, gently take up any slack and simply stay in touch with the flies. Even when the flies are apparently static, waves and underwater currents will affect their action. The figure-of-eight retrieve (below) is mandatory. If you can’t master this, literally inch the flies back with plenty of pauses. Mostly, you’ll see rather than feel takes. Don’t watch the end of the fly line, this causes eyestrain, and is only worthwhile in flat calms. Train your vision on the fly line mid-section, or where it enters the water, off the rod tip. Any bowing in the line, caused by a crosswind, will straighten when a take occurs. At the rod tip, line lifting like a coarse angler’s swing tip (below) signals a taking trout. Occasionally, a heaviness or slight pluck on the line will be felt, especially when practicing the “static nymph”.